《河南嵩山》 “Henan Song Mountain” 師傅的武館位於加州洛杉磯外的一個叫做蒙特利公園的城鎮。通往位於師傅家後院的武館的小徑。 The school is located outside of Los Angeles in California in a city called Monterey Park . The path to the school behind Sifu’s house. 《方丈》“Abbot” 雖然師傅是國際著名的詠春拳師傅，他是一個非常平易近人又幽默風趣的人。我們上課時經常可以聽到笑聲四起。 Although Sifu is a renowned Wing Chun master in the world, he is a very approachable and humorous man. One can hear laughters during the class all the time. 《藏經閣》 “Library of Kung Fu Books” 所有武館的課程和一些詠春拳概念都清楚列在牆上。師傅用一個非常有系統的方法來教導他的學生,每個人都知道學習到那裡，也知道他們未來將學習什麼。所有師傅的DVD也列在牆上。The school’s curriculum and some Wing Chun concepts are clearly listed on the wall. Everyone knows where they stand in the system. 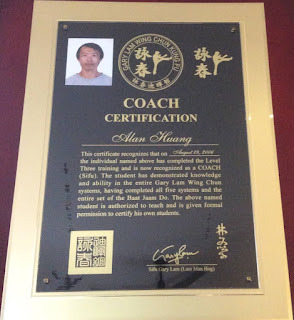 All Sifu’s DVD are listed also on the wall. 《三十六房》《木人巷》 “36 Chambers” and “Wooden Man Alley” 武館有木人樁，腳樁，棍樁,刀樁,沙包...和最有名的床墊。從第一天學習小念頭和踢腳樁至《頂房》的八斬刀，學生在每個階段都會學習不同的技能。武館裡有一棵大的橘子樹,我們休息時經常會拔樹上的橘子來和師傅一起吃。The school has wooden dummies, kicking dummy, pole dummies, sand bags… and the most famous mattress. Sifu uses a systemic way to teach Wing Chun. 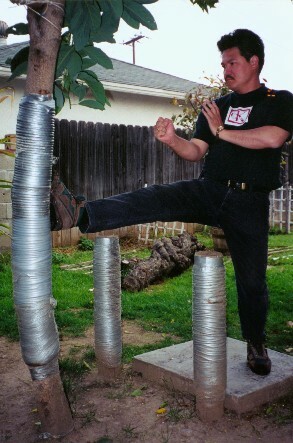 From learning Siu Nim Tao and kicks on the kicking dummy to Butterfly Knives, Sifu uses a very systemic approach to teach his students. There is a big orange tree. Often we will eat the organs from the tree with Sifu while taking a break. 《長住院》 “Monks’ Living Quarter” 師傅的後院有一個小房子供他的入室弟子居住。到目前為止，有來自德國，英國，希臘，加拿大，阿根廷…等和從美國其他州來的學生已經在那裡住過。Sifu has a small house for his private students to stay. So far, there are students from Germany , UK , Greece , Canada , Argentina …and students from other states that have stayed there. 《下山》 “Leaving the Temple” 據傳說在古代少林僧人準備離開寺廟時雙臂要烙上左青龍右白虎才算「出師」, 也證明他們是從少林出來的才能夠下山走江湖。而師傅的武館以發證書來代表學生的程度。對我個這學藝不精的人來說，這證書不是證明我功夫的高低，而是一個小男孩終於實現他多年前學武夢想的一個重要紀念品。The legend has it that in the old days when the Shaolin monks ready to leave the temple, they would get burn marks of dragon and tiger on their forearm to prove they were from Shaolin. I got a certificate instead. To me, instead of proving my skill level, this certificate is an important memorabilia of a boy finally fulfilled his dream.